Anderson Larson Saunders Klaassen & Dahlager is pleased to announce that Griffin R. Leitch has been named a partner at the firm. Griffin has been an attorney with Anderson Larson Law Office since 2014. He has an active litigation practice, practicing in the areas of family law, criminal law, contract law and bankruptcy. Griffin is a graduate of Willmar High School, a 2011 graduate of the University of North Dakota, and a 2014 graduate of William Mitchell College of Law. Griffin is admitted to practice law in the State of Minnesota and the United States District Court, District of Minnesota. Griffin is also a member of the Minnesota State Bar Association. PLEASE JOIN US IN CONGRATULATING GRIFFIN. Anderson, Larson, Saunders, Klaassen & Dahlager PLLP and the Benson Area Chamber of Commerce are pleased to announce that Holly Erickson has accepted a dual position as a Legal Assistant at the Benson office of Anderson Larson Saunders Klaassen & Dahlager and Office Manager for the Benson Area Chamber of Commerce. Holly was born and raised in Benson and is currently living there and raising her five year old son Emmett. She graduated from Ridgewater College and has previous experience in an office, restaurant management, and child care. We are very excited for her to be part of our team and she looks forward to working with you. For more information please contact Holly at Holly@willmarlaw.com or 320-403-4437 (Benson) /320.235.4313 (Willmar). The firm of Anderson, Larson, Saunders, Klaassen & Dahlager, in the 12th District, have been long time volunteers with our program. From June 2016 through May 2017, the firm has accepted 48 cases; everything from Wills, Fair Debt Collection, Custody, Step-Parent Adoptions, and Contested Divorce matters. Greg Anderson also volunteers with our Kandiyohi County Legal Advice Clinic. He is always willing to call a client to give immediate advice when needed. If it was not for the firms time and continued support of the Volunteer Attorney Program, many area residents would not get the help that they desperately needed. Our students went to court today…to learn! Sarah Klaassen, partner at Anderson Larson Law Firm, discussed her path into law, the different areas of practice, and then took us on a tour of the courthouse. 1. Manage client/customer expectations upfront. 2. A diverse team is a successful and sustainable one. 3. Going to the courthouse on a tour is better than going in shackles and an orange jumpsuit. 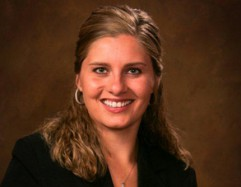 Anderson Larson Saunders & Klaassen is pleased to announce that Kristal R. Dahlager has been named partner at the firm. Kristal has been an attorney with ALSK since 2013, practicing in business law, real estate, probate and estate planning. Kristal is a native of Sacred Heart, Minnesota, a 2005 graduate of the University of Minnesota in Duluth with a B.S. in statistics and actuarial science, and a 2012 graduate of Liberty University School of Law. Kristal is a member of the Minnesota State Bar Association. PLEASE JOIN US IN CONGRATULATING KRISTAL. Anderson, Larson, Saunders & Klaassen PLLP is pleased to announce the opening of a new branch office in Benson, Minnesota at 1216 Pacific Avenue. Opening an office in Benson enables Anderson Larson to provide its clients in Swift County and the surrounding areas with easy access to quality representation in litigation matters, including family law, criminal defense, personal injury, workers compensation, and social security disability. The Benson office will soon be staffed Monday through Thursday from 10:00 a.m. to 4:00 p.m., with additional days and times available upon request. Anderson Larson looks forward to meeting you in Benson.